Plus, a recipe to test your cooking technique. Belgian beef and onion stew with beer (carbonnades flamandes). A bowl of piping-hot beef stew feels like a rite of winter in New England, especially when the mercury dips as it has this season. Meaty stews are familiar to many cooks — small chunks of meat from a tough cut cooked slowly in liquid until they’re super tender, the flavor is deep, and the liquid has developed into a sauce or gravy. More often than not, vegetables find their way into the pot, too. Most meat-based stews adhere to some well-established techniques. With that in mind, I’m focusing this week’s column on the basic tenets of beef stewing and including a single recipe for Belgian Beef and Onion Stew with Beer (Carbonnades Flamandes). In most beef stews, the pieces of meat are relatively small, often about 1 inch thick (though I prefer them larger, around 1½ inches). 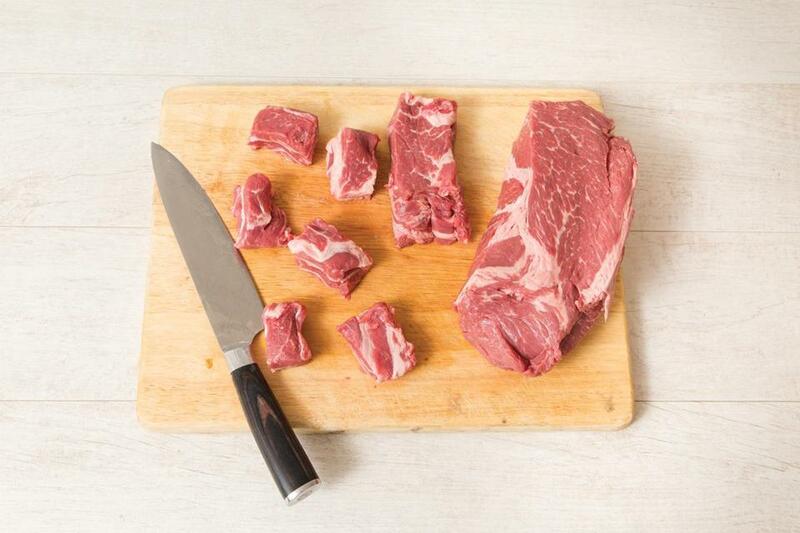 Most supermarkets sell packages of small pieces labeled “stew meat,” but in my experience the meat is inconsistent in size, cooking characteristics, texture, and flavor, indicating that it comes from different cuts of the animal. When I make a beef stew, I buy a chuck roast (from the shoulder) and cut it into pieces myself. Chuck roasts include some marbling with intramuscular fat and connective tissue, which melt and gelatinize during long, slow cooking, helping to promote tenderness. Be sure to buy one that weighs a half to a full pound more than you need, to account for the trim. Though there are exceptions to this rule, most stews begin by browning the meat to create a fond — the brown film and bits that stick on the cooking surface. The fond significantly boosts the overall flavor of the stew. 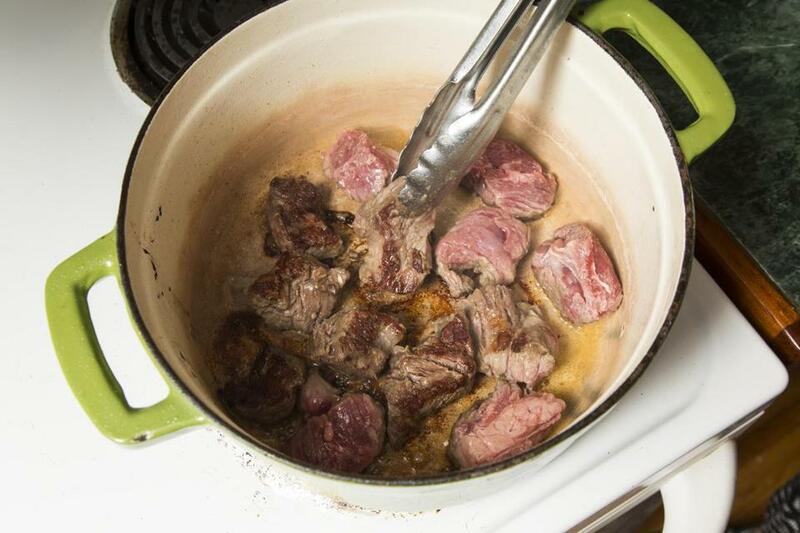 For optimal browning and fond development, make sure the meat pieces are dry, and leave a little space, at least ¼ inch, between them in the pot. If they’re jammed together, steam can’t escape, inhibiting both the browning and the fond. This usually means browning the meat in batches. A heavy pot or Dutch oven is preferable for both browning and slow, even cooking. Cast iron, enameled or not, and fully clad pots (with an aluminum core that extends across the bottom and up the sides of the pot) are great choices for good heat retention. Make sure the pot is thoroughly preheated (the oil will shimmer, and perhaps just barely begin to smoke) before adding the meat, and don’t disturb the pieces until they have browned on the bottom and you’re ready to turn them over. Use medium-high heat, as opposed to high, to make sure the meat browns and the fond develops well, but that neither scorches. 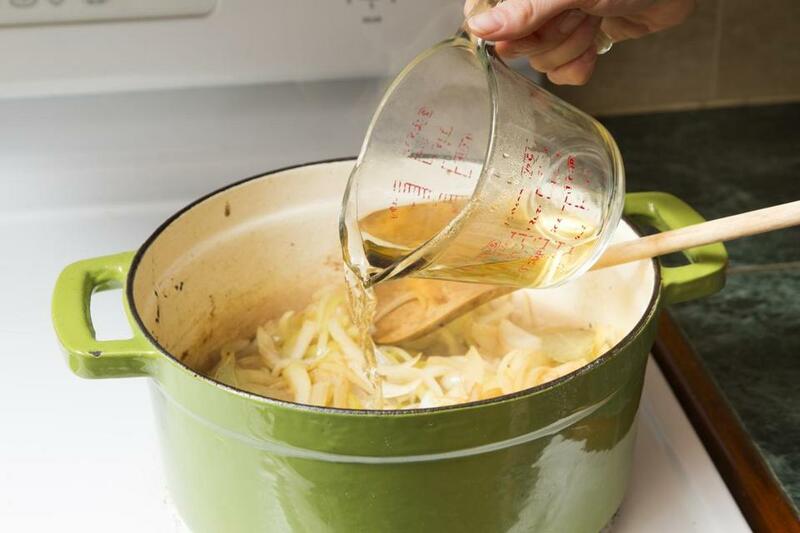 After browning the meat and aromatics such as onions, garlic, and spices, deglaze the pot — removing the food particles that are stuck to it — by adding the liquid and scraping the fond off the bottom of the pot so it dissolves into the liquid as it comes up to temperature. This beef stew recipe includes a large quantity of onions, and the liquid they exude as they soften deglazes the pot. The cooking liquid, in this case broth and beer, deglazes any residual fond. Note: In a stew, the food is nearly submerged in the cooking liquid. In a braise, the liquid generally reaches about halfway up the food. For a stew to be its best, it must cook slowly, at a relatively low temperature. This allows fat and connective tissue in the meat to melt and gelatinize, eventually resulting in tender meat. For more consistent heat that fully envelops the pot, I’ve come to prefer the oven to the stovetop. 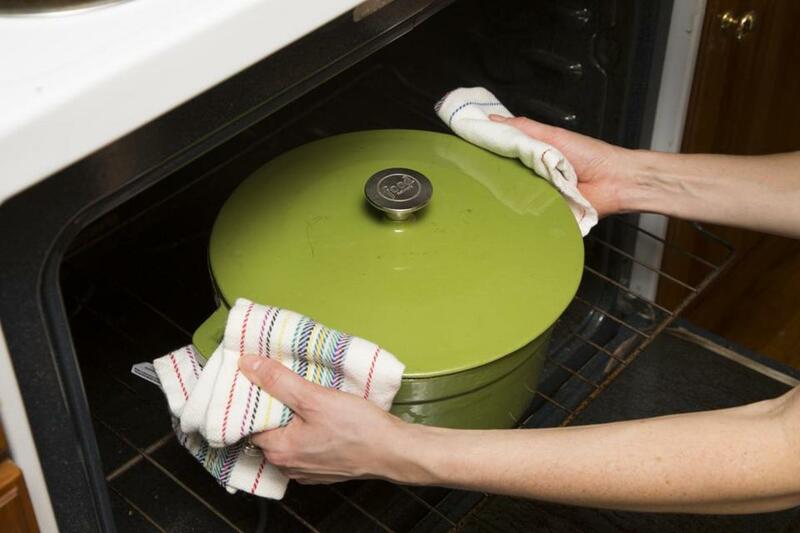 Cover the pot to trap heat for some or all of the cooking time. First, thickening the sauce is not strictly necessary, but many recipes call for it, often with a little flour. I like a sauce with a bit of body, so I thicken lightly. Second, while the onions in this recipe must cook down completely, when a stew includes other vegetables, I prefer them tender but not mushy.To avoid overcooking, add them to the pot according to their cooking times. (Pieces of carrot, potato, or winter squash would go in long before more tender vegetables, like bell peppers or peas, or fruit.) Last, stews reheat well and taste more developed and mellow the day after they’re made, so make a big batch! The large quantity of onions in this stew produces a lot of liquid, so I remove the cover partway through cooking to allow for some evaporation. 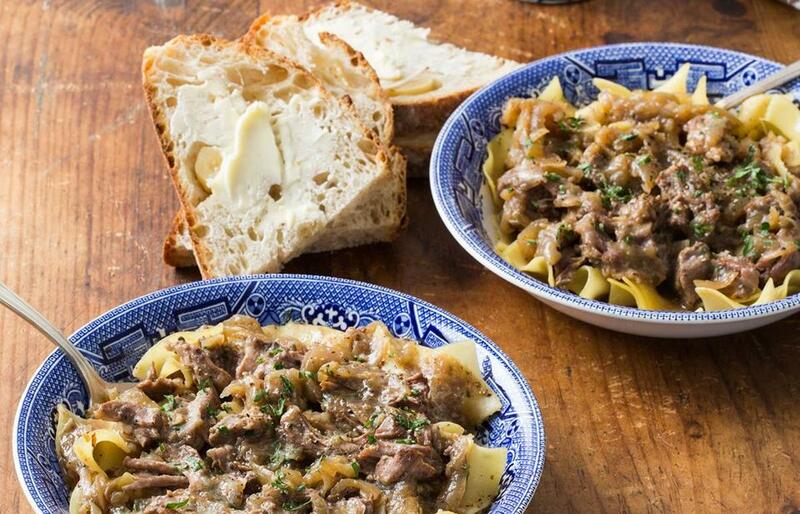 Serve with boiled potatoes or buttered egg noodles. With the rack in the lower-middle position, heat the oven to 325 degrees. In a medium bowl, toss the beef with 2 teaspoons salt, 1 teaspoon pepper, and flour to coat. In a large, heavy Dutch oven, heat 2 teaspoons of the oil over medium-high heat until it shimmers. Add half the beef so the pieces are close together in a single layer but not touching and cook, undisturbed, until deeply browned on the bottom, about 3½ minutes. Turn the pieces and cook, undisturbed, until second side is deeply browned, about 3½ minutes longer; transfer to a medium bowl. Add 2 more teaspoons of oil to the pot, allow to heat for a moment, and repeat to cook the remaining beef (adjusting the heat as necessary if the fond threatens to burn); transfer to the bowl with the first batch. Return the pot to medium heat, add the remaining oil, and allow it to heat for a moment. Add the onions, bay leaves, and ½ teaspoon salt, stir to coat, cover, and cook, stirring occasionally and scraping the bottom of the pot to loosen and dissolve the fond, until the onions are soft and lightly browned, about 20 minutes. Add the garlic, thyme, and ginger and cook, stirring constantly, until fragrant, about 1 minute longer. Add the broth, adjust the heat to medium-high, and cook, scraping the bottom of the pot to loosen and dissolve any remaining fond, about 2 minutes. Add the beer, brown sugar, vinegar, and ½ teaspoon each salt and pepper and stir to incorporate. Add the cooked beef with accumulated juices, submerge it in the liquid and onions, and bring to a strong simmer. Cover and place in the oven until the beef is very tender, about 2½ hours, removing the cover about halfway through (to help concentrate the flavors). Remove the bay leaves. Adjust the seasoning with salt, pepper, and vinegar if necessary. Add most of the parsley, stir to combine, and serve at once with boiled potatoes or buttered egg noodles, sprinkling each portion with some of the remaining parsley. Adam Ried appears regularly on “America’s Test Kitchen.” Let us know how you like this technique-focused column by writing to cooking@globe.com.